Klippenstein just wrote the piece “Saudi Arabia Using Law Firm Tied to Trump to Lobby U.S. for Nuclear Deal” for The Young Turks. He writes: “A law firm that reportedly has advised President Trump’s real estate empire registered last month to lobby the Trump administration as part of Saudi Arabia’s bid for U.S. approval for a civilian nuclear power program, federal documents show. “King & Spalding, an international law firm headquartered in Atlanta that reportedly has worked for Trump’s real estate concerns, disclosed that Saudi Arabia was paying the firm up to $450,000 for a 30-day period. The disclosures were made in a filing with the Justice Department, as required by the Foreign Agents Registration Act (FARA). “The contract was registered with the DOJ on February 21. Five days later, Energy Secretary Rick Perry canceled a trip to India so he could fly to London to discuss a nuclear cooperation agreement with senior Saudi officials. Such an agreement could open the door for lucrative U.S. contracts to build the kingdom’s new power plants. “The Trump administration’s negotiations around Saudi nuclear power have been controversial. 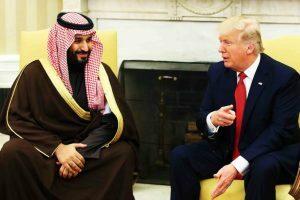 Unlike other countries seeking the use of U.S. nuclear technology, Saudi Arabia refuses to sign any agreement prohibiting uranium enrichment, which could be used to produce nuclear weapons. “King & Spalding and its alumni have multiple connections to the Trump administration.